Capcom held a panel on the upcoming Resident Evil 2 remake at San Diego Comic-Con today to reveal new details about the upcoming revisit to Racoon City, changes to Leon Kennedy and Claire Redfield, and an exclusive $200 collector's edition. At San Diego Comic-Con, Resident Evil 2 producer Yoshiaki Hirabayashi was there to share development updates, and concept art from the upcoming remake. Or rather, apparently Capcom prefers to think of Resident Evil 2 as a complete redesign instead of as just a remake. While Capcom hasn't released the concept art publicly, you can find photos from the panel shared on Twitter and social media from people who attended. According to Hirabayashi the theme of the remake was meant to evoke the horrors from dark and wetness. The rainy day in Racoon City the day of the outbreak led to many visual cues for how to design the world, including flooded areas and puddles. The zombies were also designed with the same themes of dark and wet in mind leading to the rotten, pallid quality of their skin. Apparently, some of the zombies were even designed after members of the dev team. Claire and Leon also got some big redesigns for the game. Claire's new look is described as "biker ninja" and according to social media reports the team decided ultimately to "ditch the hot pants" and base her design on the scene of Claire riding into the city. She even rides an official Harley-Davidson. Leon was also given a refreshed look meant to evoke his youth and inexperience, especially compared to his later appearances in the series. For both Leon and Claire photogrammetry was used to scan real life versions of their outfits so they can be recreated in-game. 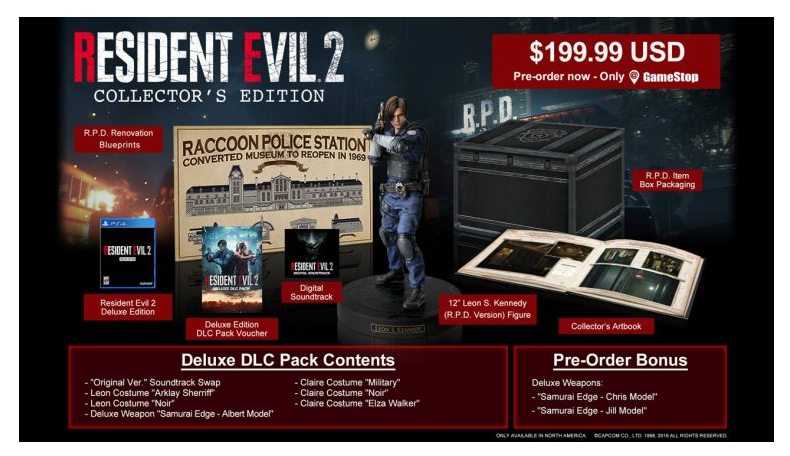 Capcom also revealed a new $200 Collector's Edition exclusive to GameStop that includes the full game, a deluxe box packaging, DLC costumes for Leon and Claire, a 12-inch Leon Kennedy figure, a 32-page art book, digital soundtrack, and a poster designed to look like the blueprints for the Racoon City Police Department redesign. There will also be a $69.99 Deluxe Edition that includes the game, DLC costumes, and a classic soundtrack swap. We played Resident Evil 2 Remake at E3 2018 this year and gave it our game of show. Capcom completely reimagined their classic PS1 survival-horror games to the point where it feels entirely new. Resident Evil 2 remake goes above and beyond to deliver a terrifying new adventure into a much more brutal Racoon City. For more including trailers and news check out our Resident Evil 2 Remake guide. Tagged with Capcom,	News,	PC,	PlayStation 4,	Survival Horror,	Xbox One. Five Nights at Freddy's VR Delayed, Might Have "Extra Surprises"
You've received a stay of execution, pizza boy.